You will easily overlook the tiny plants of the Cretan Solenopsis, but they are definitely worth a closer look. Solenopsis belongs to the Lobeliaceae and was for a long time included in the genus Lobelia L. Ever since 1729 there has been much confusion about the correct name and even in 1976 Tutin et al in the Flora Europaea included all Mediterranean taxa in Laurentia gasparrinii. In 1979 Meikle revived the name Solenopsis. In 1998 Crespo, Serra & Juan described the genus Solenopsis and provided a clear key for identification. But this Solenopsis is easy to find, you don’t have climb mountains or to wade in winter through a cold sea to a neighbouring islet. No, Solenopsis is, for example, quite abundant on the shores of the Kournas Lake (Limni Kournas, the Lake of Kournas, near Georgioupoli). It was here that I first met this lovely tiny plant. In the full sun of the gorge of Messavlia the plants are not “higher” then 4 cm, on the beach of Kournas Lake in the shade of Myrtus, Chase Trees (Vitex agnus-castus) and Oleanders I found slender plants up to 10 cm long. 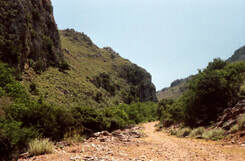 And with the help of the above mentioned article of Crespo and colleagues (1998), the species of West Crete are not too difficult to identify. Solenopsis is endemic to the Mediterranean region and the Canarian islands. Solenopsis minuta (L.) C.Presl subsp. annua Greuter, Matthäs & Risse. Enough theory, let’s take a closer look at the plant itself. And what an interesting plant indeed ! In the prefecture of Chania, I always found them near sweet water. And that means that the plant is rare but locally abundant. On the shores of Lake Kournas I found hundreds, but limited to only two or three meter from the water. Other places where I later found this plant are in the very beginning of the gorge of Messavlia and in the gorge of Douliana around the church. The leaves are spathulate or lingulate, wavy or entire on long pedicels and often possess on the leafborder some microscopical small glands. Along the pedicel of the flower you can find one to three small bracteoles ( 2-3 mm) with some obvious glands. You can find inclusions, probably oxalate crystals (commonly called “sand”or “crystal sand”) inside the leaves and pedicels, but these are very clear to be seen in the bracteoles where they accompany the xylem-vessels in nice rows of cells with crystal-inclusions. 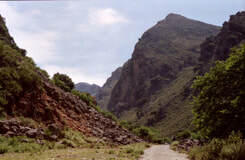 The gorge (farangi) of Messavlia in spring. After heavy rainfall wild rivers can cross this “unpaved” path. The color of the flowers is blue-purple and white. 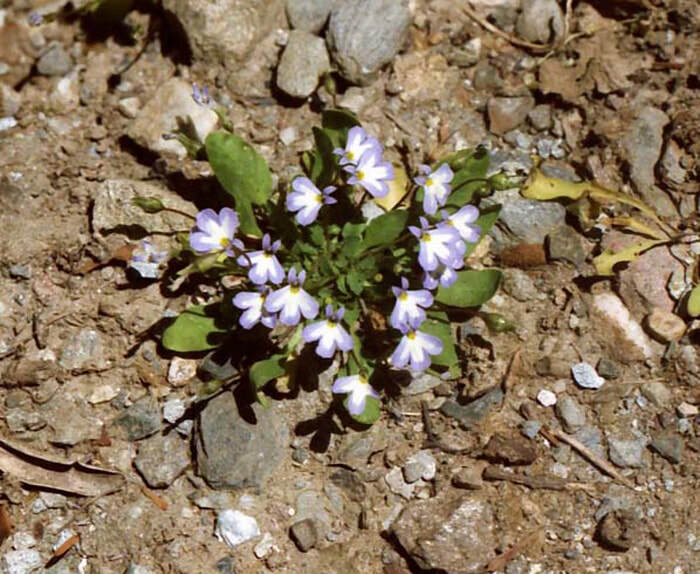 The flowers stand solitary in the leaf axis on long slender pedicels and they are unmistakable ‘lobelia-like’: meaning that the five petals are unequal : two small petals upwards and three large downwards. The corolla-tube is completely fused, the calyx has five lobes. On the throat and lower petals are papillae. The size of these papillae are an identification mark. closed by two bushes of papillae and two thorns. Because the two lower anthers are smaller then the three upper anthers, a downwards curved androecium develops. The anthers are introrse, so the hollow space formed by the five anthers becomes filled with pollen. Yet, there is quite some variation in leafshape and flower-design, indicating that Solenopsis minuta subsp.annua mostly depends on cross pollination. And indeed, it possesses the same beautiful mechanism as the Compositae to prevent self-pollination: the pistil-head of S. minuta exist of two lobes which are closed in the young flower with the fertile tissue at the inside, while the outside is covered with sterile tissue. As the pistil grows upwards, the pollenmass is pushed out through the small opening at the top of the anthers, while a ring of hairs just under the pistil works like a broom. The pollen are eaten by small flies, who disperse the pollen from plant to plant. The pistilhead now stretches through the opening, while at the same time the anthers wither and subside. As soon as the pistilhead stretches through the opening, the two lobes open up and the fertile tissue is exposed. If you lost me on the way, please have a look at the drawing and you will understand what I tried to explain. The ovary is inferior and two-locular. 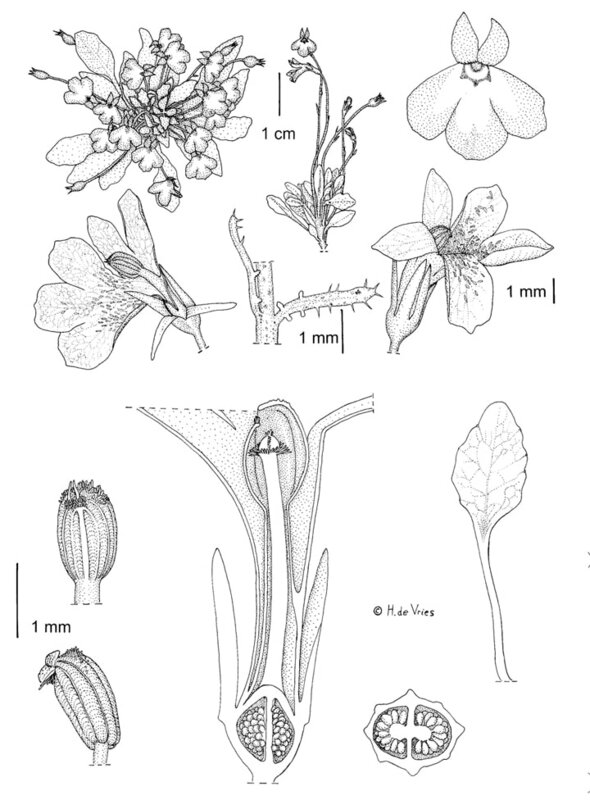 S.minuta annua is an annual plant, flowering from April to June, with flower stalks of 13 – 62 mm long, floral bracteoles 1.5 – 3.5 mm long. There are of course many more differences, and you can read them in the Crespo et al (1998) article.